Researching Amsterdam’s food scene before leaving for my 10-day trip to the Venice of the North, I quickly discovered that Dutch cuisine didn’t have such a great reputation. Fried foods, pancakes, stews and beer seemed to dominate the culinary landscape. Having been to Amsterdam before and dined in an excellent restaurant (De Kas), I knew Amsterdam was a modern European city food-wise and decided it was time to scratch beneath the pub food surface and unveil the delicious treasures the city has to offer. I was in for a surprise: the food was even better than I expected it to be. 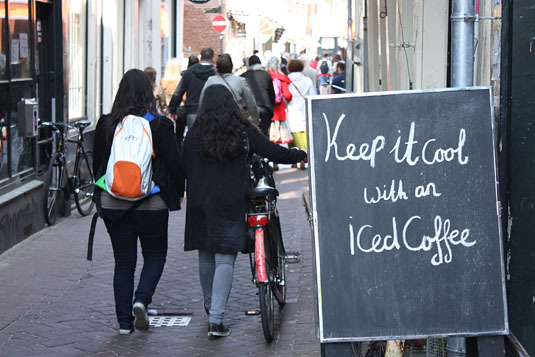 Diverse, inspired and affordable, it was on every corner of the Jordaan neighborhood where we rented an apartment. 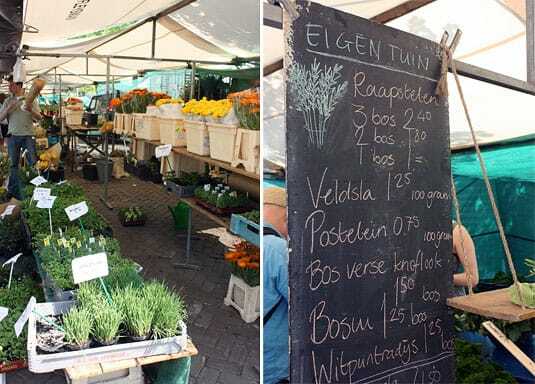 As soon as we arrived on a Saturday morning, we were wowed by the Noodermarkt, a public place by the Prinsengracht that hosts a big organic farmer’s market every weekend. 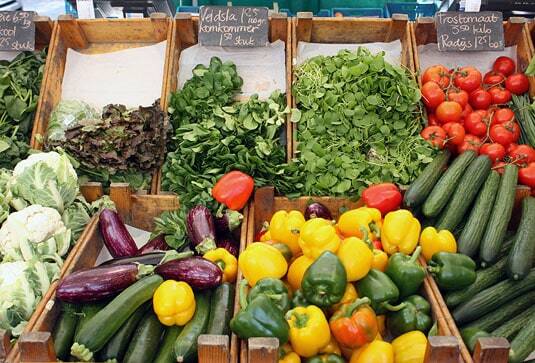 Fresh and brightly colored vegetables, deeply fragrant strawberries, luscious cheeses and the most voluptuous cakes and desserts welcomed us and immediately chased our jet lag away. The sun was there to greet us as well: after leaving our house where there were still several feet of snow sitting in the front yard, we were excited to be able to drink a glass of rosé on the terrace of quirky Café Finch, right in front of the market, and do what would become our activities of choice in Amsterdam: relaxing, chatting and people-watching. After our picture-perfect 10-day stay, I’m tempted to declare Amsterdam the best European city to live in, although I must admit the period during which we visited probably had something to do with the happy, festive and laid-back mood reigning over the city. 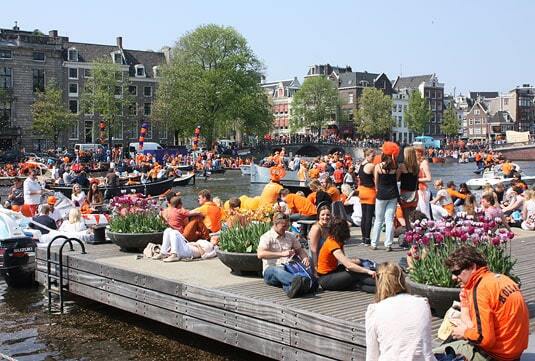 This year, Easter and the Netherland’s national holiday, Queensday, were happening within a week, which means many Amsterdammers were off work and on holiday as well. Everyone’s schedule seemed to be dictated by the sun: terraces, canal-side benches and boat rides reigned supreme. Although the streets were filled with people from morning to night, we never felt rushed, pushed or hurried, even on crazy-busy Queensday. We appreciated the friendly, efficient service we were greeted with anywhere we stopped to grab a bite or just to have a drink; the simple, no fuss but delicious fare offered in Jordaan’s cafés; the easy, relaxed and respectful way in which thousands of Netherlanders proudly celebrated their national holiday. We usually don’t like such crowds, but I’m telling you, even such a popular gathering could not deter us from having a good time – I think we even enjoyed it. Food-wise, we enjoyed a wide variety of meals, from on-the-go snacks sold by food trucks to intricate tasting menus. Seriously, I don’t think we had one bad meal in Amsterdam. Where was the awful, heavy food everyone in forums and discussion boards seemed to dread? Of course, you’ll find crap in every capital of the world, but doesn’t it all come down to the choices one makes? Yes, there were plenty of “American hot dog” stands, cheap pancake joints and fast food chains, but why go there when it’s so easy to find a small neighborhood café, just a few steps away on a side street, that serves crispy toasted sandwiches, fresh salads and excellent coffee? 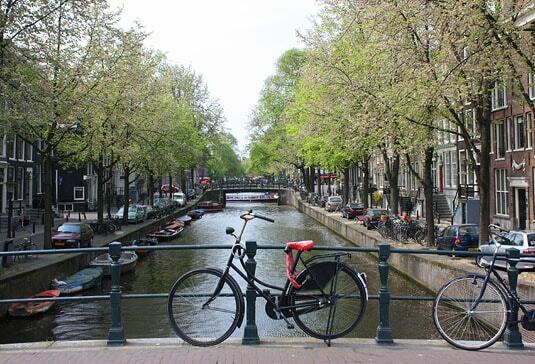 All of this without breaking the bank: we’ve found Amsterdam to deliver some of the best value for every euro spent. 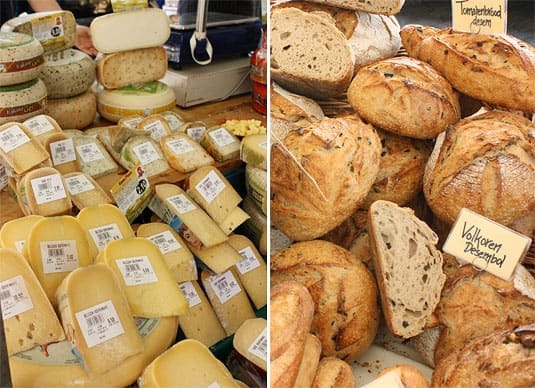 We’ve had many meals (including, for example, 2 sandwiches, 2 drinks (wine or beer), 1 dessert and 2 espressos) costing us less than €20 – a total that barely covers lunch for one in a Parisian bistro or café. One local specialty I was warned against were the local pancakes, the pannekoeken. Dutch pancakes are pretty famous and so they are prone to be badly made with cheap ingredients (just like crêpes in Paris). Not so at Pancakes!, a very small restaurant on a Jordaan side street that seems to be loved just as much by tourists as it is by locals. It’s there that we had a memorable first encounter with Dutch pancakes: thicker than a crêpe but much thinner than an American pancake, very large (almost 1 feet in diameter), crispy on the outside, moist and tender on the inside and garnished either traditionally or more imaginatively: after licking my plate clean, I couldn’t understand why there aren’t more foodies chanting the praises of the Dutch pancake over the web. And that’s before I even tasted poffertjes, adorable, miniature, fluffy and deeply addictive pancakes enjoyed with a generous knob of butter and a heavy sprinkling of powdered sugar. These things are pure enchantment, E and I had to fight over the two servings we had around the end of our trip. We’re grateful we didn’t find out about these earlier or we probably would have overdosed. Dutch pancakes two ways at Pancakes! : Goat cheese, spinach, garlic oil and pine nuts (left); camembert, chicory, ham, raspberry sauce (right). Poffertjes, the delightful miniature Dutch pancakes, are made on a special cast iron griddle punctuated by dozens of shallow rounds cups. The mini-pancakes must be turned by hand with a fork before they’re ready to be enjoyed. 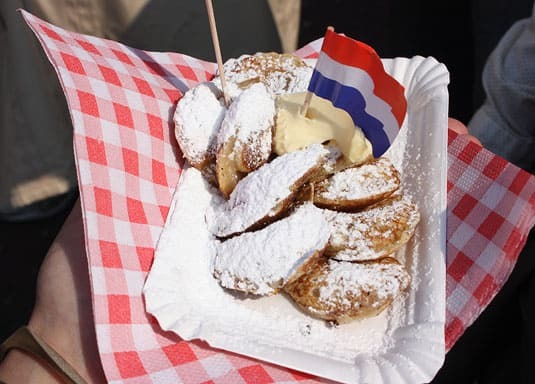 Dutch poffertjes, served with a generous knob of butter and a heavy sprinkling of powdered sugar. For lunch, we usually went for broodjes, or sandwiches. Amsterdam loves its broodjes: they are found in all cafés, served hot or cold, garnished in many different ways. 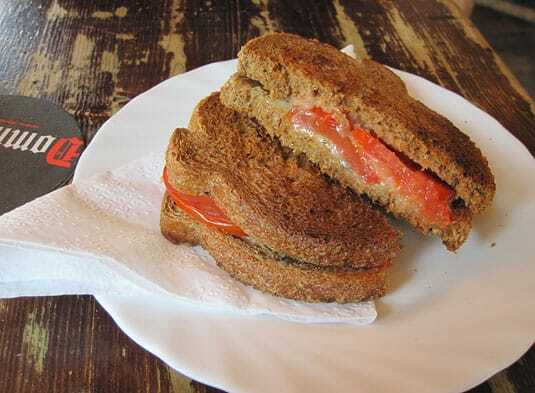 A tosti is a toasted sandwich garnished simply with cheese and meat or a choice of vegetable. 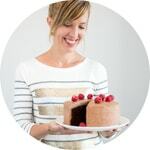 Cold sandwiches are filled with fresh ingredients and served in whole-grain sandwich rolls or Italian-style ciabatta (I love a city where wheat bread is always the default choice!). A classic tosti at Jordaan’s Kat in the Wijngaert. 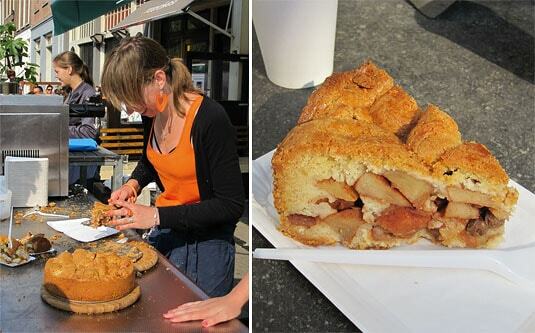 Amsterdam’s quintessential and unavoidable dessert is the appeltaart, or apple pie. It’s on every menu and it never tastes exactly the same. It’s basically an open deep-dish pie (2.5-inch thick) with a sablé crust, served with whipped cream (for which there is sometimes a surcharge). I believe we’ve had appeltaart four times (for the sake of research, of course!) Sometimes it was sweeter, sometimes tarter; sometimes lots of spices and cinnamon were added, sometimes only the pure taste of baked apple came through. Before leaving home, I had read about Winkel, a Jordaan café very famous for its apple pie, which is reputed to be the best in Amsterdam. People seemed to love Winkel’s pie, coming to Jordaan just to enjoy it and sometimes even waiting in line to get their slice (especially on Saturdays, since Winkel is located right in front of the popular market). We figured we would stop for sure at Winkel once during our trip, but we quickly discovered that the café was temptingly located right in front of the apartment we rented. Sitting at our dining table, we could literally survey the terrace and decide when it was best to go snag a spot. You’ll guess that we did indeed (more than once) enjoy the famous Winkel pie, and YES, it did live up to its reputation. Its secret is the crunchy, buttery, caramelized streusel topping – absolutely irresistible. Not to be missed. 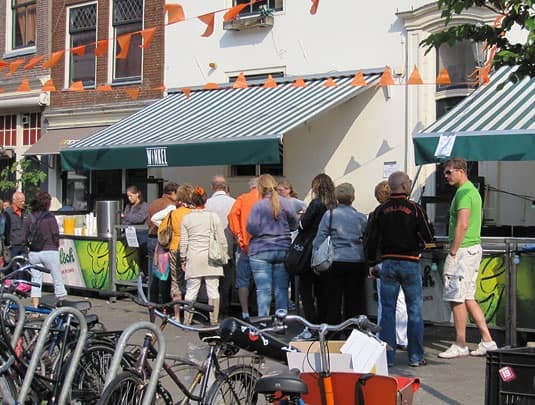 The line waiting to get a slice of the famous Winkel apple pie on Queensday. Under the striped green canopies is usually a large terrace that is always busy, from morning to late night. A Winkel server working as fast as possible to satisfy the crowd hungry for apple pie; a slice of the famous Winkel apple pie. 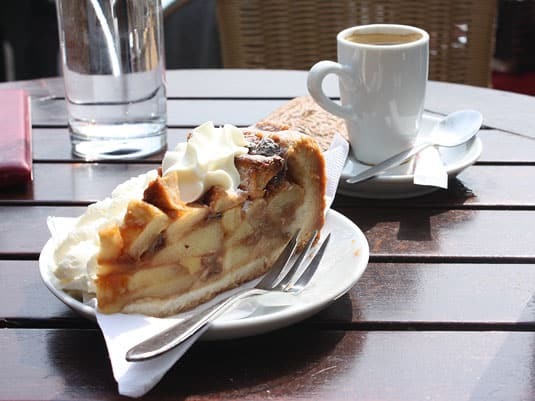 Another café, another kind of appeltaart: this time, no crumbly topping, just a generous serving of apples and a dollop of whipped cream (at ‘t Smalle Café, Jordaan). Now, on to fried foods. We usually abide by the philosophy that they are best enjoyed in moderation, but considering the number of times we stopped to have a drink, it was unavoidable that we try some of the most popular snacks, like kroketten and bitterballen. 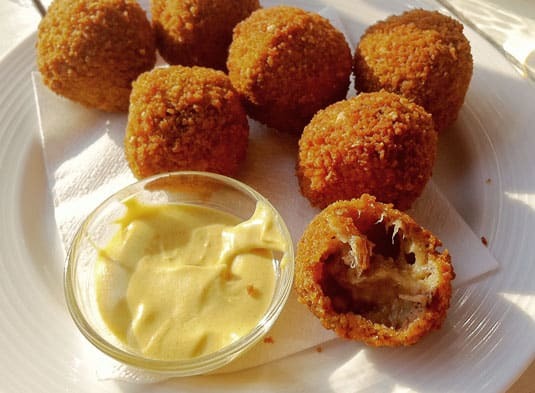 Kroketten are oblong in shape and they’re usually made of a meat mixture (or sometimes mashed potatoes) covered in breadcrumbs – and deep-fried, of course. Bitterballen are the round variety that’s most often served with mustard. 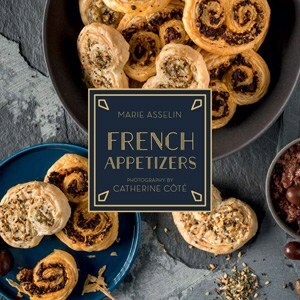 Saying that these snacks are made of meat is a bit like saying that McDonald’s chicken nuggets are made of chicken: they do contain meat, but the protein is mixed with broth, seasonings and then flour for thickening. 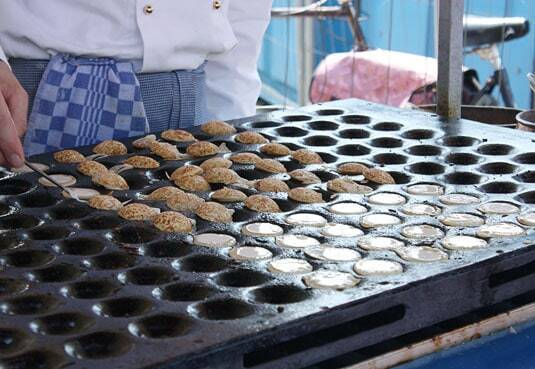 The mixture is then cooled so it firms up, then it’s rolled into balls, battered and fried. We had a sample plate of these snacks at a café and we weren’t impressed. Frankly, before I read more about bitterballen, I was a bit afraid to find out what was really in them. The texture is a bit strange: it’s very soft, almost melting. 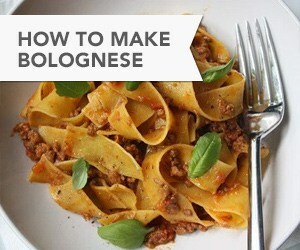 It tastes of meat, but no minced meat is discernible in either taste or texture. It’s the kind of snack with which you have a love/hate relationship: you would never have it on its own, but it goes down very well with your beer. 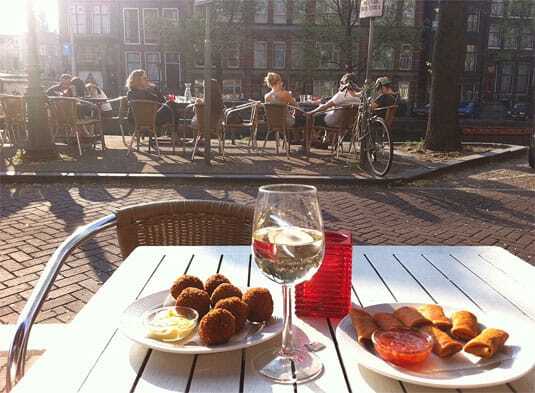 Sunny happy hour by the canal side with white wine and Amsterdam bites. Zooming in on the strange insides of a bitterballen; not my favorite thing in the world but it goes down easy with beer. 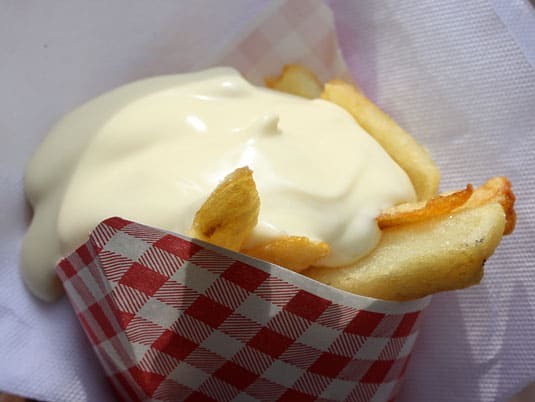 Last but not least in our “Amsterdam classics to taste” list were the frites, thick-cut fries served with mayo. 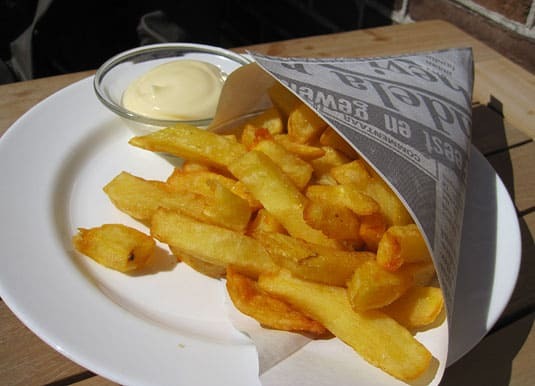 Also called Vlaamse frites (Vlaamse meaning “Flemish”, referring to their Northern Belgium origins), they are found all over town, sold by street-side carts, take-out counters, falafel and fast-food joints, cafés and even fancy restaurants. They are golden, very crunchy on the outside, tender on the inside and always served piping hot in paper cones with a (very) generous dollop of mayo on top. In fact, the fries are literally drenched in mayo: when you first get your cone, you barely see the fries at all. I’m sure there are plenty of places where they are made poorly, but the places we’ve been to fried them to order and they were indeed very good fries. Interestingly, we had our best frites outside of Amsterdam, in the small village of Zaanse Schans where we visited windmills. They were served with mayo on the side on the terrace at lunch time by a rather fancy restaurant named De Hoop op d’Swarte Walvis. Totally addictive! A typical Vlaamse frites joint in the center of Amsterdam. I found this little guy very inviting and couldn’t resist tasting my first Vlaamse frites right then and there. There’s often a large choice of sauces more adventurous customers can choose from to go with the fries instead of regular mayo. 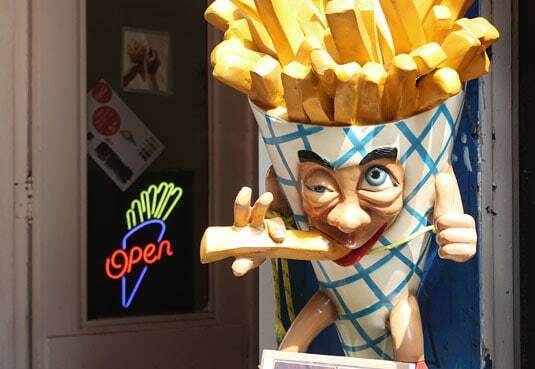 “Fancier” fries in Zaanse Schans, outside Amsterdam. To say we enjoyed eating in Amsterdam would be an understatement. There are gems to be found, even in the fast-food category. I said it earlier and by now, maybe you’re convinced: it’s time Amsterdam looses its bad culinary reputation and gains the one it deserves: that of a modern European city evolving through the latest food trends and making the most out of it. 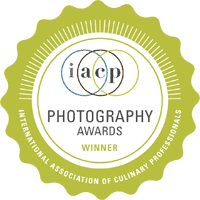 I think there’s an incredible culinary tourism market to develop out there; who’s with me? Quirky café with sandwiches, pizzas, salads and great music. Off the beaten path Jordaan café. 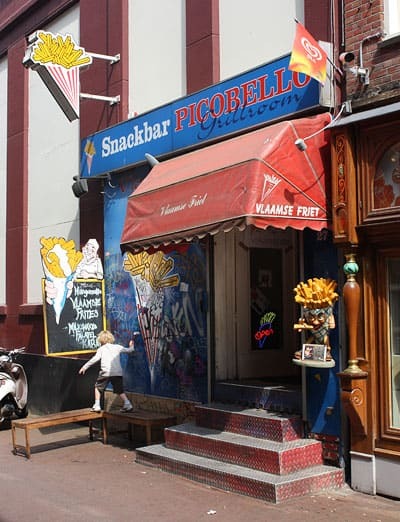 Great place to have a broodje or a tosti. Amsterdam’s best apple pie. Great place to have a drink as well. Open daily from early morning to late night. Great place to have lunch. Best terrace in Jordaan. Good, classic, fried to order fries. 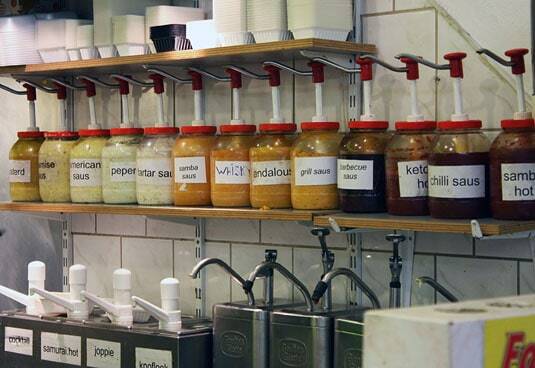 Impressive choice of sauces. Open daily morning to late night. Good classic French restaurant outside of Amsterdam in the small touristic village of Zaanse Schans. Great place to stop for lunch while visiting the windmills. Next time you’re up that way check out een vis twee vis (one fish two fish) I’ve eaten all over Amsterdam since the 90s and it’s my favorite restaurant in the whole city. 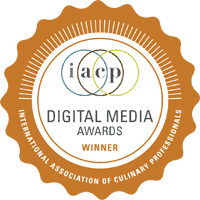 Chef owned and operated. 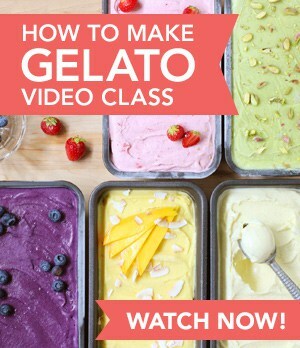 Thanks for the recommandation, I will definitely check it out. im from amsterdam but living in manhattan, this article makes me home sick. all the restaurants are amazing. 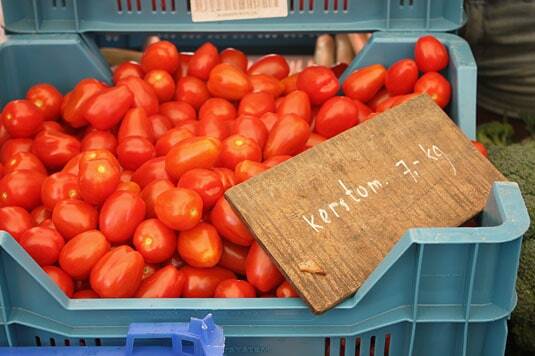 De kas is my all-time fav!